Hypnos explore the murky world of Rebetiko, an urban folk music of the immigrant Greek underclass borne out of the various conflicts and resulting hardships experienced in Greece and Turkey around the end of the 19th Century and the first half of the 20th Century, in particular the 1923 population exchange between the two countries. Often referred to as the blues of Greece, traditional musical forms of the Eastern Mediterranean fuse with songs of love, hate, joy, sorrow and hashish. 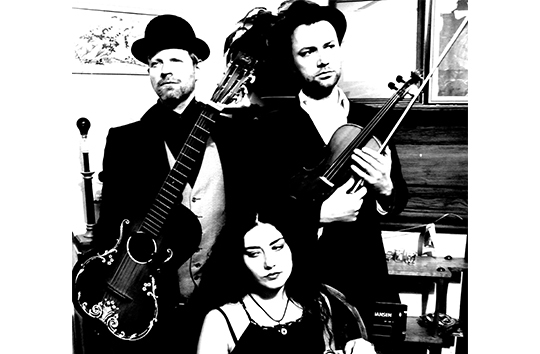 Hypnos combines the haunting vocal melodies of Briar Prastiti, melancholic violin lines of Tristan Carter and the virtuosic guitar of Justin Firefly to create an intimate experience of their most-loved Rebetiko songs. Best experienced with a bottle of your best ouzo. Yamas!